Pacific Science Center just installed some amazing new ginormous photographs. They’re right outside the planetarium, beside the Gemini Capsule. Our public unveiling of these images will be Wednesday, November 18th at 10am. The images we’re putting up are a celebration of the International Year of Astronomy from three of NASA’s Great Observatories, and we’re launching a full morning of fun celebrating everything space-y! There will be fun space exhibits from Science on Wheels, science experts on hand, and free planetarium shows … not to mention the pictures themselves. I have a number of free passes good for that morning: e-mail me at alice_enevoldsen (at) pacsci.org if you’d like some for you and your friends. See you there! Oh wow. I was just there (approx. 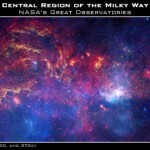 six hours ago) and I saw the lovely photo of the Eagle Nebula, but I didn’t see that one. If I had I would have talked a certain short person’s ear off about it.